Crystal Dunn played well in all three phases of the match in North Carolina's 4-1 win over Seattle Reign FC. 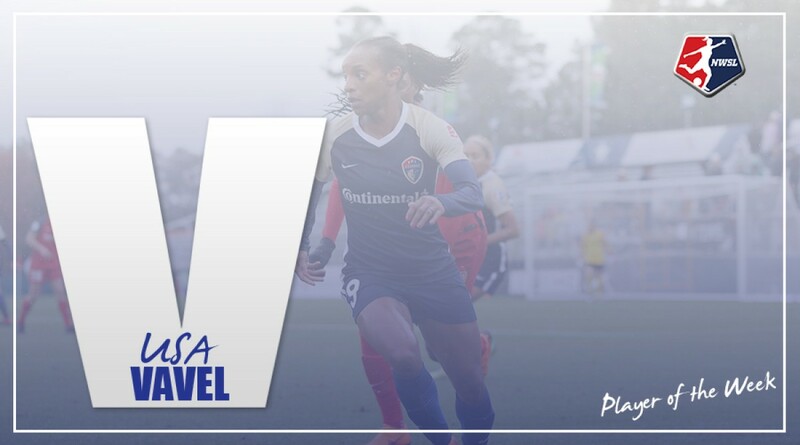 Forward Crystal Dunn scored a brace in the 4-1 win by the North Carolina Courage over Seattle Reign FC on Saturday and earned the Week 13 Player of the Week honors, as voted by the NWSL Media Association. Dunn has been integral for the Courage this season as they have rolled to a league-best 10W-3D-1L record. North Carolina sits 11 points clear of the second-place Orlando Pride on the league table. Dunn scored her first goal of the match in the 33rd minute. With the score knotted at one goal each, the Courage were on the front foot. A Seattle defender cleared the ball out of bounds deep in their own defensive third. Forward Jess McDonald took a signature long throw with Seattle meandering around. The ball surprised Lynn Williams, who chested it down and played it back to Dunn at the top of the box. She took a touch and powered the ball into the left-hand side of the goal past the outstretched hands of Seattle goalkeeper Lydia Williams. The goal gave North Carolina a 2-1 lead heading into halftime. ​Early in the second half, defender Merritt Mathias took a cracking shot from distance to put the Courage ahead by two goals, but it also energized Seattle. After nearly 15 minutes of solid pressure by the Reign, the Courage staged a counter attack. Lynn Williams took the ball from midfield, dribbled straight at the Seattle defense and drew six players toward her. She calmly slipped the ball to the left into the path of a streaking Dunn. 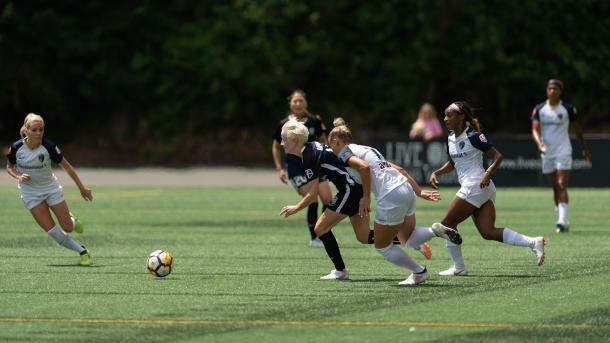 With the entire Seattle defense forced to pivot, Dunn was able to take one touch to get behind the back line and finished easily against Lydia Williams. The ball hit the right side netting. It was the second goal for Dunn and the second assist for Williams in the match. Dunn now has six goals on the season. One behind Portland Thorns FC striker Christine Sinclair, who leads the league with seven scores on the season.